How to plant a young Oak tree. When is the best time to plant your tree? Trees can be planted at any time of the year provided that you follow the watering and planting instructions described below. This does mean that you can plant your tree during the winter when the tree is dormant. Planting a tree in winter allows the tree to focus on root growth. Measure the distance between the soil in the tree's pot and the bottom of the pot. Next dig a hole slightly shallower than this distance. For the width of the hole, widen the newly dug hole to 3 times the dimension of the pot. Now you're ready to actually begin planting. Position the tree in the middle of the hole. Do NOT add any soil amendments. Backfill the hole around the plant with native soil; loosely packed down. There should be a mound around the actual area of the tree. Baby trees require watering on a regular basis for at least the first year to ensure good root structures. Most trees will require a soaking about every four days. This timing may vary if you have very sandy soil where water flows through quickly or heavy clay soil which holds on to the water longer. Test the effectiveness of your watering by sticking a PVC pole down in the area close to your new tree. How far you are able to push the pole down into the ground is an indicator of the moisture level. If the pole will only push down into the ground for a few inches, you have not watered sufficiently. The ultimate goal in watering is give your tree a slow deep watering to the root ball of the tree. Shallow watering of your plant will not promote root growth. Excessive watering of your new baby tree can cause root rot. Watering directly on the base of the tree can also cause root rot. Purchase a soaker ball at a local hardware store. Purchase and install a drip irrigation system found at most home improvement stores. Regardless of which means you choose, do not place the watering device directly against the tree itself, rather place it a few inches away to encourage root growth beyond the existing root ball. There are a multitude of benefits to mulching the base of your tree. Mulch applied correctly will help retain the moisture around your tree and, equally importantly, stop the grasses or other weeds from growing. Trees do not like the competition from grasses and weeds. This is an important point because the weeds and grasses will complete you're your new baby tree for the water. Additionally, mulching will prevent the sun from easily drying out the soil moisture around your tree or heating up the soil excessively during the warmer months. Stones mulch spread across the top of the soil. This will cause the ground to dry quickly around the root ball. Bermuda hay around the base of the tree. Bermuda hay contains seeds for its' grass. This type of grass puts down very deep root meaning that it will extremely difficult to remove once established and will also compete with the roots of the trees for a greater depth. Another means to help retain water around the tree is to build a small burn (earthen ring several inches high) around the outside area of the mulch. This will aid in preventing the water from running away from the tree's root ball. A word of caution regarding the use of weed killers. Do not use Round Up or similar type of product to kill off weeds and grasses around the base of the tree. These products stay in the ground for a long time and can be absorbed by the tree, possibly damaging the tree root structure. After the initial year of caring for your tree, you might need to re-mulch the area around your trees. Mulch can break down and loose its ability to retain moisture. The frequency of watering can also be reduced. You will probably need to water your tree about once every two weeks. Again, ensure that it is a slow deep watering to aid in tree root development. Oaks trees will 'flush' multiple times during a year depending on the weather conditions. If you are not familiar with the term 'flush', it refers to a growth spurt by the tree. During these flushes, a tree can grow from several inches to a couple of feet. 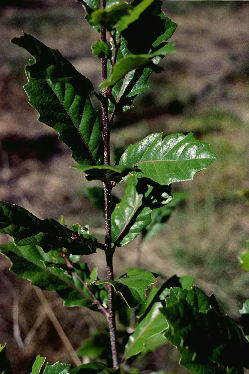 The vigorousness of the flush is partially dependent upon the Oak tree genus. 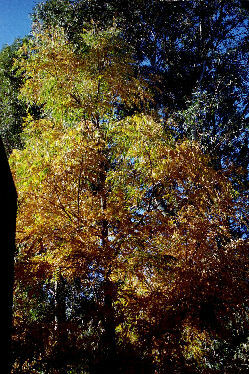 Texas Live Oak trees may grow several feet whereas a Cork Oak may only flush several inches.